This is both one of the most important advantages of plastics, and regrettably, one of the most misunderstood properties of the material. It’s safe to assume most people first experience plastics in consumer items. Plastic bags, disposable food containers and breakable toys. However, the relatively weak properties of consumer plastic vs. high-quality industrial plastic used in mills are very different. In wear guides, as bushings, or sprockets or numerous other mill applications – plastic will outwear metals such as bronze and babbit and outwear them significantly. A lifespan increase of 2-4x is common. This improves productivity and reduces downtime. Plastics save on energy costs in two ways, both largely unknown by the public. Firstly, in many sawmill applications the low coefficient of friction that many plastics have mean that, particularly in applications involving drive chain, plastics will mean less horsepower and energy is required to move the chain. This can result in substantial energy savings. Also, take for example the SharkFin product: unlike other board turning systems, the SharkFin is powered by gravity alone and doesn’t need a single joule of electricity to function. An even less known fact about plastic is that plastic takes less energy than metal to produce. This means that for each part you swap out for industrial plastic, you are also helping the environment. Sometimes metal just simply doesn’t work well in an application. Consider this case study, you’re a maintenance manager at a sawmill that has recently been cited for exceeding noise limits. Is there any way to make your metal sprockets less noisy? Is there any metal alternative to our Deadplate shock absorbing urethane? If you require impact-resistant safety “glass” in a booth…What metal will be transparent? Sometimes a metal solution simply does not exist. But plastics can provide a viable solution for problems that no metal, no matter the price, can solve. 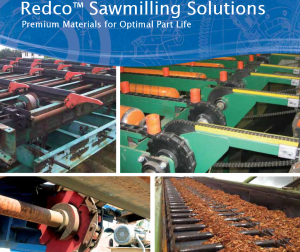 For more information on how plastic can increase profits and reduce downtime or for a copy of our sawmill solutions catalog, please contact Redwood plastics today.